For the first time mentioned in the historical literature in 1327, Olesko functioned as a real defensive center holding a castle. But the earliest settlements belonging to “vysotska” and “cherniakhivska” cultures, are dated by the II–I centuries B.C. Probably in the 13th century the high hill among the bogs was the outpost of the ancient Plisnesk. The history of the city is directly related to the history of the castle. Being first mentioned by the historians in 1327 (related to Jurij the II) the castle of Olesko most likely had been already built on a high hill in 1250–1280. At that time it was made of stone – that was really new in the construction of the ancient Rus fortifications. But such a way of building had been predefined by the destructive fights with Mongol–Tatars (wooden buildings often perished from fire). The castle was surrounded by a high stonewall. In 1340 it became the possession of Lithuanian-Russian prince Lyubart. An infatuation of Halytska Russ by king Casimyr took place in 1349. 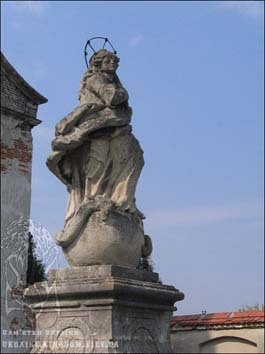 In 17 years, by setting the "eternal world" between Casimyr and Lyubart, Olesko with the row of other cities passed to the ownership of Poland. Alexander Koriyatovytsh later had become a proprietor of Olesko only for a couple of years, because already in 1370 the castle was seized By Lyubart again. There were constant fights around the castle, and the historical sources specified about the facts that different army units stayed in the castle permanently. 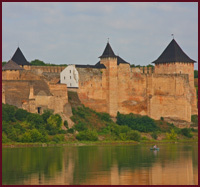 The famous “Oleskyi Castle defense” took place in 1431, as the castle was the resistance center to Poland seizure of the ancient territory of Ukrainians by then. The commander was the local leader Ivashko Presluzhich Rohatynskiy who managed to gather for this purpose the representatives of the upper class. Although the seizure lasted for 6 months, the Polish army did not conquer the castle. 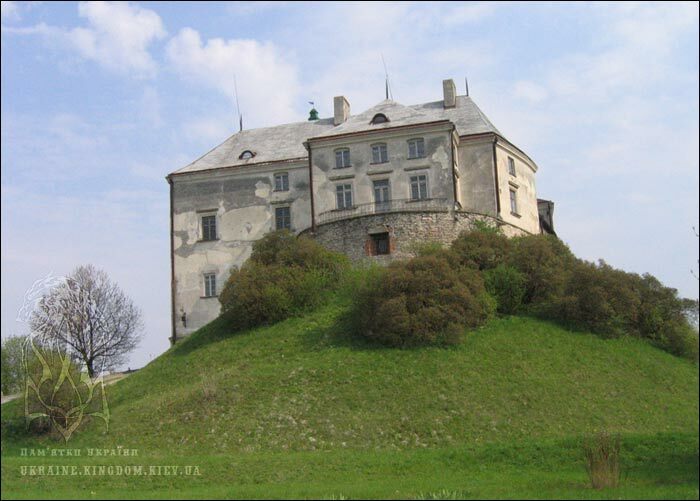 Only the following year, being surrounded by more numerous and well equipped Polish army, Oleskyi Castle was conquered. The Polish king granted all the defenders of the castle with the privileges of the dominion for the villages they had been born in. In 1441 the following Polish king Vladislav Varnenchik passed Olesko, Brody and Lopatyn to the disposal of Jan from Sienna. After Jan’s death his son Peter, mentioned in the historical sources as Oleskyi, got the government of that territory again and in 1481 he built a defensive cathedral in the center of Olesko. In the end of 15th century the town was devastated by permanent attacks of the Tatars. They used to capture the peasants from the surrounding villages; though the majority of town inhabitants found the defense behind the walls of Olesko fortress. In 1511, after Peter Oleskyi’s death, the castle was divided into two parts – each for one of his two daughters: Anna and Yadviga, who had married Frederick Gerburt and Martin Kamenetskyi as well. 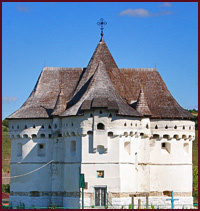 In 1580 half of the castle was sold to Stanislav Zholkevskyi. It’s interesting to admit, that only in 25 years the two parts of the castle became the possession of one family again, because in 1605 Zholkevskyi made his daughter marry the Anna’s grandson – Ivan Danilevich. (After Gerburt’s death in a fight with Tatars near Sokal, Anna married for the second time and became George Danilevich’s wife). Considered to be the real “social climber”, Ivan tried to get the privileges of the upper class by all means. So he married Zholkevskyi’s daughter Sofiya, who became his second wife. The first one was Katerina Krasitska, whose dowry he managed to use for the castle reconstruction. Alongside with the second wife Ivan obtained not only the other half of the castle, but also Chyhyryn with all the surrounding territories. He became a “castelan” (the head of the town in the 17th century) of Lviv, and later even “Russian voevode” (as the upper class of nobility was called then). It’s interesting to mention that Sofiya lived in Zhovkva, but after her marriage certainly moved to Olesko. To guard Sofiya Zholkevskyi sent his best Cossacks, Mychailo Khmel'nytskyi among them (the father of future hetman of Ukraine). As he was the castle manager for some time, Bohdan Khmel'nytskiy’s childhood passed in Olesko. Ivan Danilovich built in Olesko a school and a hospital, and the reconstruction of the castle was completed in 1620. In the eastern and western sides of the castle there were constructed two-storied buildings, besides the galleries between the apartments and the tower over the entrance gates were made. On the portals and the gates there appeared coats of arms. It was the very time when the castle acquired the appearance close to its modern one. So the castle became the real mighty magnates (noblemen) residence. At first stages of the castles reconstruction Ivan Danilevich got help from his first marriage father-in-law, who had already great experience in building a castle in Krasychyn. A romantic but very tragic event took place in Oleskyi Castle in 1615. Adam Zholkevskyi publicly committed suicide, protesting against Ivan Danilovich refusal to let him marry Marianna (Ivan’s daughter from the first marriage). But the fate played a trick with Ivan – one of his sons perished in a fight with Tatars and the second person died being yet a child. Marianna became the heiress of the castle and married Konetspol'skyi. Here is another interesting fact from the history of the castle of Olesko: here in 1629 the future king of Rich Pospolyta – Jan Sobeskyi the III – was born in the family of Teofilia Danilovich and Yakub Sobeskyi. In his memoirs Jan writes: "I was born in Olesko, the castle on a high mountain, a mile from White Stone, where another king (Michael) was born. During my birth it had been raning so strongly, that my mother’s tailor got deaf and could not hear to his very death. At that time Tatars attacked the villages surrounding the castle". Also in his memoirs King Jan the III mentioned about the birth of Michael Korybut Vishnevetskyi. During the Liberation war (in 1648) the family of Konetspol'skyi abandoned the castle. Damaged greatly during the battles, it was obtained by Cossacks. Later the castle was liberated from Cossacks, and in 1682 Jan became its owner again, having paid Konetspol'skyi’s debts. In a letter to his wife Maria Jan remembered about his visit there and described the castle in such a way: "... the castle and the whole territory are greatly devastated, but the village is safe and the church where my grandfather the Russian voevode Danilovich lies is all right." Jan’s favorite wife Maria Cassimira (Marysen'ka – as he tenderly calls her) started to do her best, making the castle look properly. Her special gift for her husband was the reconstruction of the room where he was born. The castle was ready for the king’s visit by the summer of 1684. The couple of the owners visited Olesko only few times more. The flashbacks of Frenchman Daylerak about the castle of that time are also worth attention: "The rooms are all very beautiful, spacious, high, well lighted up, decorated with large pieces of artificial marble. Servant’s building has a nice vault on an orchestra. The well is of the extraordinary depth, because to reach water it was necessary to dig the well up to the very foot of the mountain. Everything here reminds the ancient beauty of a prospering farmstead". When the king and queen died, their son became the owner of the castle and sold it to Stanislav Zhevuskyi in 1719. 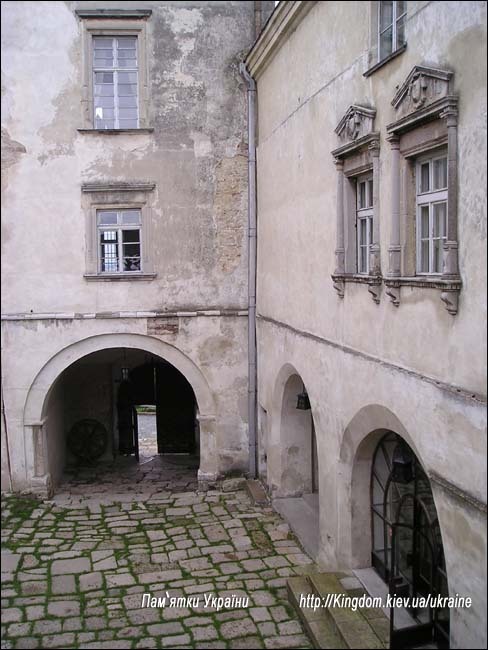 Afterwards the proprietor of the castle became Stanislav’s son Severyn who reconstructed the castle into a palace. The idea to give names all the rooms appeared quite at that time. Later we’ll give the detailed description of the castle’s interior, for it is quite interesting and beautiful. Severin’s brother became the owner of the castle after his death, so all the precious things and treasures were taken to Pidgirtsi. Oleskyi Castle was sold in 1796 to Zelynskyi, and already in 1824 the new owners – Litinski – lived in the castle. Accidentally they found a treasure in one of the rooms, and thereafter the whole castle was turned upside-down in search for new money-boxes. The earthquake of 1838 made new harm to the castle – cracks had appeared. So it needed to be rescued, and princes Sangushko and Chartoriyskiy with their friends decided to do it. They bought the castle back in 1891 and started the restoration works. But World War I did this business vain, and only in 1933 there was a new attempt to reconstruct the castle. But because of lack of money all the works lasted till the World War II. 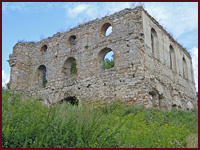 In 1941 a monastery and a camp for captives were arranged in the castle. So the fire harmed there everything that people could not make harm to. In 1951 lightning got in the castle and it blazed up. A great deal of exhibits and architectural values were drowned in fire, the castle died slowly. Different architects, masters and restorers gathered together to revive the castle and to defend it from making there a “rest-home” (as it was popular at that time). At the end of 1975 the castle began to function as a museum. Once there was a balance-bridge in a castle. Now a comfortable path leads to the castle, so don’t be in a hurry – get pleased with wonderful landscapes. The entrance gates of the castle will meet you with beautiful barellief. It represents God Father in the middle and the figures of Faith (to the left) and Justice (to the right) by the sides. In a center of the barellief there is a shield with the family emblem of the castle owners – Gerburt and Korchak, and the shield is supported by the angels. There are three portraits of Polish kings by the sides. Above all this God Father holds an apple – His commandments – with his hand heaved up to caution from their violation. The idea of the composition is the following – God is Life, Truth, Power and Love. The monastery was founded by Severin Gevuskij, and his choice of Kapuziniv to build a monastery was caused by the populations high disposition to revolt, and the last thing had to be supressed. The architect Martin Dobravskij was invited for the construction, and later he became a member of the monastery. The construction was finished in 1737. 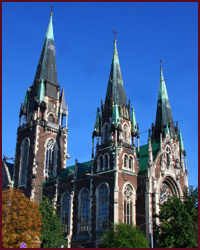 The central building was St. Anthony’s church, in front of which three stone sculptures of Mother Mary, St. Anthony and St. Onuphrei. 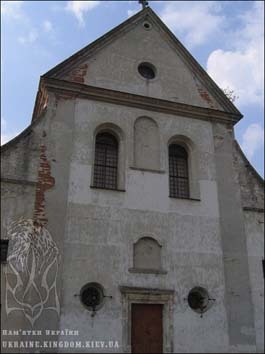 The church inside was decorated by Simon Tchehovitch. The three-meter high wall surrounded the territory of the monastery where five stone chapels, two pounds and a garden could have been found. 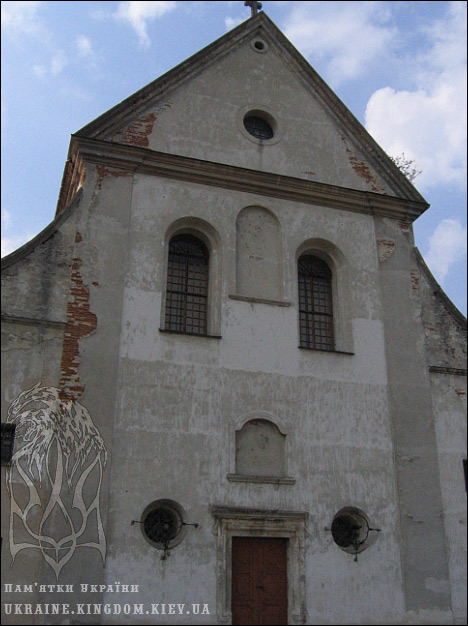 In 1755 Severin Gevuskij was buried here. There were also a library and an archival depository, that have disappeared in 1785 when the monastery was closed by the Austrian power and turned to a field hospital and the church insie was damaged at the same time. In 1788 was given back to the Kapuzines thanks to the intervention of ceasar Joseph the ІІ. The church functioned till the soviet power organized here a camp for the polish prisoners in 1939. In two years, in 1941, it happened, that the monastery became a German camp for soviet prisoners. Later the place turned to a ghetto, and later to a military storage. After the place was freed from occupants, here was organized an agricultural college with a hostel and other needed buildings. In the 80’s the buildings of the monastery were given to the museum “Oleskij Castle”, they have been repaired, two chapels were rebuilt and new trees were planted. Now there is a museum of Art and a keep. But in 2004 I could not enter the territory, as well, as the church.